The Friends hosted a stall at the community fete at the newly re-opened Streatham Library on Saturday. It was a great event – the hall was packed all day with local people collecting information from community organisations, indulging in the fantastic offering of cake from the W.I., and generally enjoying the buzz. We got the chance to talk to people about our work on the Common and in particular our plans to re-design and re-plant the White Garden. 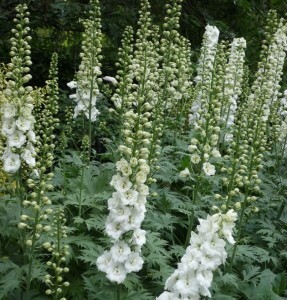 We offered passersby the opportunity to choose a plant for the new White Garden from a list of four choices. The contenders were: Echinacea purpurea ‘White Swan’, Delphinium ‘Galahad White’, Lamprocapnos spectabilis ‘Alba’ and Cynara cardunculus. We received 98 votes in total and we’re delighted to say that Delphiniums won the day! These stately white-flowered perennials will be making an appearance in the new planting scheme, to be planted later in 2014.